1. “What children need most are the essentials that grandparents provide in abundance. They give unconditional love, kindness, patience, humor, comfort, lessons in life. And most important, cookies.” By Rudolph Giuliani. 2. ” A house needs a grandma in it.” C By Louisa May Alcott. 3.”Never have children, only grandchildren.” BY Gore Vidal. 4. “When grandparents enter the door, discipline flies out the widow.” By Omar Sharif. 5. “My grandmother started walking five miles a day when she was sixty. she’s ninety-seven now, and we don’t know where she is.” By Ellen DeGeneres. C.
6. “My grandmother is over eighty and still doesn’t need glasses. Drink’s right out of the bottle.” By Henny Youngman. 8. “Elephants and grandchildren never forget.” By Andy Rooney. 9. 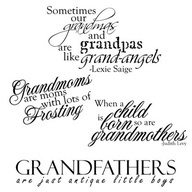 ” The best babysitters of course, are the baby’s grandparents. You feel completely comfortable entrusting your bay to them for long periods, which is why most grandparents flee to Florida.” By David Sedaris.